LANNES: Force set up and scenario for first battle. Having set that up, we used the system from Field of Battle for introducing variety in to the Scenario. First, we determined the effects of Fate. Each of us rolled 3 D4's for Fate, followed by a D12 for each. After that, each commander allocates a Die Type to each of the Four Decision Areas. As we both have D10 C-in-C's, We each had D10, D10, D8, and a D6. The allocations were done secretly as follows - numbers in parentheses indicate the allocated die type prior to modification by the Fate process. Thus it appears that the French, while having overall superiority in numbers in the area, suffered serious delays due to administrative foul ups, and will be outnumbered well into the battle. Fortunately, the Russian outposts were very lax, and that combined with inspiration on the part of the French leaders, will at least allow them to refine their tactical arrangements once the Russian intentions are clear. We decided to generate the Battlefields using our Warplan 5/5 cards. Rolling randomly, including several back ups in case a district that was all water or otherwise deemed mutually unacceptable, we determined that the battle will take place in district 28A.14, as shown below. 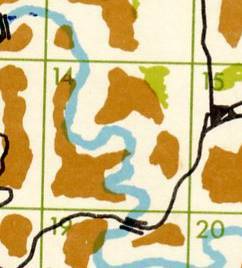 The Warplan 5/5 Atlas further describes this district as "Bleak rocky District - River Deep. Running through deep rocky gorges. Very poor road." The nearby village is AINSWORTH (as in ains worth much, I think!). So this would appear to be the Battle of Ainsworth Gorge, 1799. The hills will obviously be Class III rocky hills, the River Class III fordable by Infantry only (it wouldn't make much of a game if unfordable, and Class III is bad enough! ), with a single class II pine woods. When I set up the table, I will probably leave just enough room along the river banks for a unit (Light Infantry only!) to move in March Column on either side of the river. I don't think my advantage in Cavalry will prove much use in this battle! This will be a 6 x 6 table. By the time we get to the third game, I think we may want a larger table. At that point I think we will just add one of the 2-4 adjacent squares, which we can determine randomly or by mutual agreement. Barry and I have been talking about doing a simple "campaign" framework for some Napoleonic games between us. As his collection is mostly Russians, he would obviously use them, and I would use French and French Allied troops (i.e, Confederation of the Rhine, Kingdom of Italy, Grand Duchy of Warsaw). Brent Oman has been working on ideas for an adaptation of his excellent Theater of War rules for Piquet campaigns for his Field of Battle ("Season of Battle"), but it seems unlikely that they will be available before the end of this year. Similarly, Bob Jones has many fascinating ideas for a Campaign system based upon Die Fighting ("Die Marching"), which he and I have discussed on several occasions the past 5 years or so, but it doesn't seem like we'll be seeing that any time soon either. That got me thinking about the ACW "Campaign" played by John and Adam, as detailed on John's Blog, using the system included in Sam Mustafa's* "Longstreet" rules. Thus inspired, I thought something based (only) upon my impression of Sam's ideas might be worth exploring. 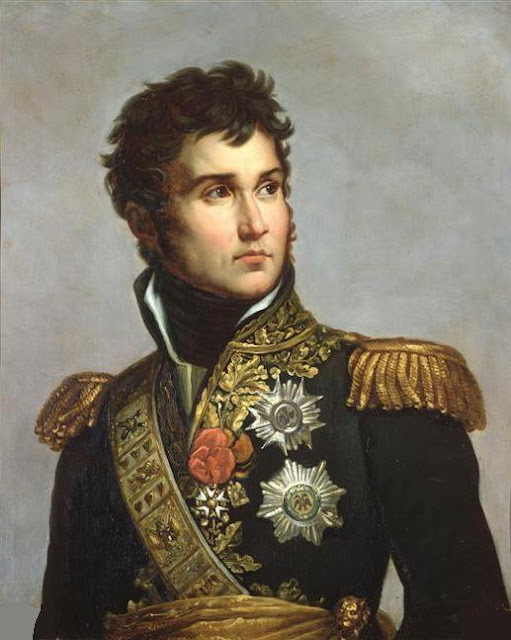 In deference to Sam's apparent fondness for Generals with a last name starting with L, as well as to the Marechal himself, I have termed this working project, "Lannes". It might just as well be Langeron, or Lichtenstein, or Lutzow, or Leith! We will be using Field of Battle 2nd edition for this project, although in many ways I think Die Fighting 2 might be even better suited to this concept. Food for thought there, Bob! *Disclaimer: I'm not Sam (despite how many times he has changed his handle on TMP), nor do I play him on TV. I'm too cheap to buy a copy of Longstreet (no ACW armies or plans) to steal the actual ideas, but I have had dinner with him! The idea is that we would each start as an aspiring officer in our respective armies - say a Major (Chef de Battalion) or Colonel, thrust into a position of higher command by influence and/or the incapacity of those senior to us. We would thus start in command of an augmented brigade of troops. After each battle, there would be the opportunity to gain in professional ability and/or subordinate commander(s), for the quality of our troops to improve (or decline), and for units to be added (and sometimes, detached from) our commands. The idea is that over time our command would increase to the size of a Corps with supporting troops. In Field of Battle, each unit has a Defense Die type or DD rating (ranging from D4 (worst) to D6 (average), to D8 (elite), up to D10 (generally only senior Guard units). The DD is used primarily when a unit is shot at - thus a higher DD makes a unit less likely to suffer losses from enemy fire. It also modifies melee if my DD is higher than yours. Units also have a Combat DIe type or CD rating. This is the basis for shooting at the enemy, and engaging in melee combat. These range from D8 (poor) to D10 (average), D12 (good), to D12 +1 (excellent). Similarly, Leaders in Field of Battle have an LD rating which influences initiative, movement, and rallying for troops under that Leader. These have the same range as the CD above. I am thinking that the troops and leaders would cluster at the lower end of the spectrum to start, and the same would be true of any reinforcements. However, units can improve (or sometimes worsen) in their ratings over time. * = DD4C/D8 automatic, must be upgraded to become better than D4/D8. Starting force must have at least 1 and no more than 2 Artillery units, at least 1 and no more than 3 Cavalry units, and at least 5 Infantry units. If necessary, re roll invalid unit results until one meeting the conditions is obtained. Fabian: Down 1 die type for MOVE rolls. Rash: Up 1 die type for MOVE rolls. On Each MOVE, note his LD score; Infantry/Cavalry units in his command must roll that score or more on D12 if they wish to move forward LESS than half of the full number of segments rolled. Unit is transferred out - replace with new recruit of same general type! Provisional Cavalry/Cossacks are instead promoted to Chasseurs or Chevau-Leger Lanciers (French) or Dragoons or Uhlans (Russian) D4/D8 - player choice. Any units which reach DD10 become Guard units of that type. Concussion: NC; but also LOSE Special Characteristic if present, or Roll for chance of acquiring one if has none! For the French, at least one of the 1806 reinforcements must Confederation of the Rhine or Italian; at least one of the 1807 reinforcements must be Polish. This is purely for color and has no game effects, although I toyed with a chance of CoR/Italy defecting in 1813, and loss of both for 1814.